Adam, Brian, Carmen and Jeff discuss tools they use for utility and enjoyment at home, where the cost-to-quality evaluation is slightly different than in the workplace. Jeff’s collection of tools is rather ancient, as suggested by his 35 year old corded Craftsman drill, and his 20 year old cordless Mikata drill with rapidly fading batteries. Going to big box stores (Home Depot, Lowe’s, etc.) a week or two after Black Friday is Brian’s suggestion for getting tools at a good price. A hot air gun is useful for stripping paint, melting solder, constricting heat shrink, thawing ice, and bending plastic sheet. Brian’s friend successfully removed 150 year old paint using a heat gun and a 5-in-1 painter’s tool. It’s hard to beat the utility of locking pliers, better known as Vice-Grips. While Jeff finds his Dremel rotary tool to be extremely practical, Brian has only succeeded in using his to “wreck” projects. A router table accessory has increased the usefulness of Adam’s Dremel tool. For larger scale projects, Brian and Adam find their angle grinders make short work of cutting and grinding tasks. Carmen built his workbench using the 2×4 Basics system by Hopkins Manufacturing. Butcher block countertops can be found at IKEA, although they are also available from other sources. Many common tools can be found at Harbor Freight, Northern Tool, and Tractor Supply. Supposedly, the average electrical drill is only used for a few minutes over its lifetime, although a valid study citation seems hard to locate. Carmen is happy with his Harbor Freight Big Red tool chest, which is said to deliver good bang for the buck. Adam Savage’s first order retrievability metric has led him to develop some very innovative toolboxes. You can compare your desk layout with that of others in the Workbenches and Battlestations reddits. Carmen alerts us to some well-considered workbench tips from Jeff Duntemann. An impact driver has proven a useful tool for Carmen and Brian. Versions from Milwaukee and Craftsman are mentioned. Although Brian believes no shop is complete without a Bridgeport mill, Jeff notes any big piece of equipment must be used regularly to balance the accompanying maintenance and opportunity costs. Adam opines that one’s first drill purchase should be a corded drill, as it is not subject to changes in battery technology. Rigol oscilloscopes are plenty good, say Brian and Carmen, for most home electronics projects. Some improvements can be made to the Rigol scopes, however, if one has a sense of adventure. A digital multi-meter (DMM) is a useful for troubleshooting most household electrical problems. The Digilent Analog Discovery USB Oscilloscope is recommended by Carmen as being one of the better USB scopes. This model has also been reviewed on EEVblog by Dave Jones. A ball-grid array (BGA) surface mount device uses small spheres on the bottom of the device to make electrical connections with the circuit board. Brian has had good luck with low-temperature solder paste, available from Digi-Key. Reciprocating saws, often referred to by the trade name Sawzall, have been put to good use by Adam and Jeff. 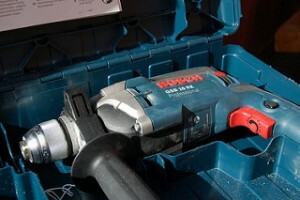 Thanks to Mark Hunter for the photo titled “Bosch GSB 16 RE Impact Drill.” Podcast theme music by Paul Stevenson.